The spring display, which isn't too far from Lake Arrowhead, is happening now. If you'll be visiting a mountain community soon, check out the yellow flowers along Highway 189. WHEN YOU THINK OF THE MOUNTAINS, the pretty lakes and hiking trails and biking areas and canyons that see snow in the winter and fall color come October, you're bound to think of the trees first, of the oaks and firs that lend so much visual beauty to the region, all year long. But there's a host of other glorious plants and flowers and shrubs to admire, and one of the most striking of sights arrives in the spring. It's when the daffodils around Twin Peaks, along Highway 189, go into bloom mode, and the story behind them is even more beautiful than the return of a springtime blossom. The flowers are part of the Julie Greer Daffodil Project, a heart-true effort that began near two decades ago when local resident Julie Greer began planting the bulbs. Ms. Greer passed away 2001, following a breast cancer diagnosis, and her husband and other people in the community continued to keep the daffodil planting going, all to honor her memory and love of these particular, and particularly joyful, flowers. THE DAFFODILS... are looking quite lovely as we journey through the middle of April 2018, per a Facebook post from the Lake Arrowhead Chamber of Commerce on Friday, April 13. So if you're journeying around the mountain communities in the next couple of weeks, keep your eyes peeled for the flowers. 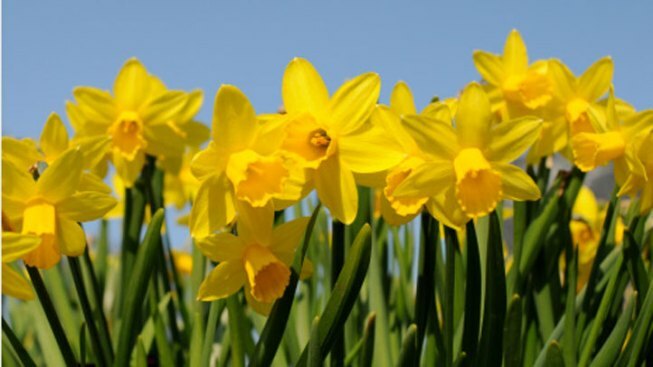 And, of course, keep in mind the memory of Ms. Greer, and all of the kind people around the area who've contributed to the Daffodil Project over the years. Our state can be quite splendid with petals around April, especially as the higher elevations begin to show their flowery stuff, but the sunshine-hued flowers around Twin Peaks are, without quibble, some of the most spectacular and meaningful.